Black/White double-paned, cut-glass "quick connect pendants" are produced with two panes of glass fused together, and then cut by hand, to create a three-dimensional design. 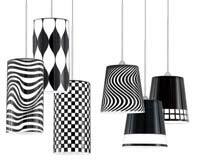 Three cylindrical pattern pendants are offered: the Daytona (G526), Harlequin (G525), and Groove (G524). Each is 4-5/8 inches wide and 9 inches tall. Buffet shaped glass lampshades, each with a 3-7/8-inch width and 4-1/8-inch height, are available in three pendant styles: Hendrix (G527), Chaplin (G528), and Hepburn (G529). Using Quick Connect QP-501 socket set components, the pendants adapt easily to the Low Voltage Monorail System, all-new Line Voltage Flexrail1 System, Monopoints, Multipoints, Line and Low Voltage Track Systems. Hardware is available in Bronze, Chrome, and Platinum finishes. A Halogen bi-pin 50-watt lamp is included with each pendant. Daytona, Harlequin and Groove styles are available as ADA sconces (3-7/8 inches wide by 11-1/8 inches high). A 60-watt candelabra lamp is included with each sconce.